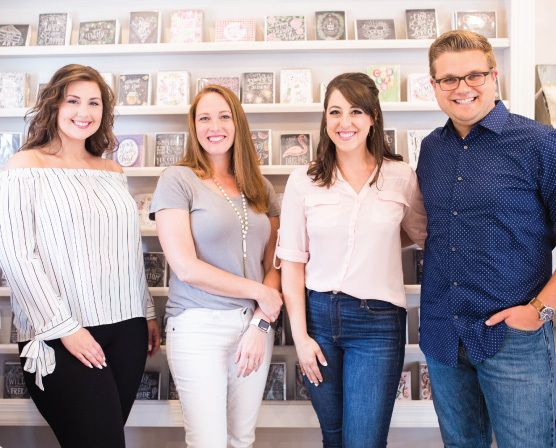 Friends, we are in the midst of National Letter Writing Month and if you couldn’t already tell, we’re big fans of handwritten notes here at Lily & Val. There’s not much that can be creatively or aesthetically done to an email or text message. Sure you can send a bitmoji, but that’s about it! With letter writing, there are endless options! You can choose the type of paper to write on, pick out a cute card, use your favorite pen, add colorful stickers or tapes, and decorate it with vintage stamps! Take the opportunity to use it as creative expression and explore hand lettering or calligraphy! I think back to my days of passing notes in elementary school and junior high! Part of the fun of it was doodling on the note (did anyone else add dots to the ends of their letters?) and folding it up in fun ways. No other form of communication allows you to show your individual personality visually like that! Your letters can become little pieces of art. Let’s be completely honest, how often are our day-to-day communication with loved ones hurried and even hollow? We’re usually texting because we need an answer to something as opposed to deliberately pausing to write something on your heart. Writing a letter is intentional. It forces you to slow down, communicate meaningfully, and recognize what’s important. There’s a special closeness that happens in receiving a letter and knowing it originated in the hands of someone you love. They actually touched it and wrote on it. Holding someone’s handwriting is inexplicably one of the ways we can feel closer to someone. It’s a little piece of them there with you, something we can hold on to and cherish. The fact that letter writing is no longer the norm makes it extremely special when you receive a handwritten note. There’s something particularly memorable about a message that someone took time to write, seal, address, and stamp. Not to mention, having a special note live forever in your inbox just doesn’t seem like enough. Having a tangible expression of someone’s thoughts and feelings is rare and worth holding on to. I’m a firm believer in the simple, small things of life becoming the big things. To me, there’s no greater example of this than with writing a letter. If you think about it, with a few strokes of handwriting, your letter has the opportunity to have a huge impact on someone’s life. You have the power to encourage, uplift, speak life, and let someone know they matter to you. Letters from my husband when we were dating and my Mom when I was in college, are some of my most treasured possessions. As opposed to a fleeting text message, your letter could be something the recipient cherishes for many years. Who’s on your heart right now? Did someone pop into your head as you were reading this? National Letter Writing Month is the perfect chance to send that card or letter! And if you need some help getting started this letter writing post is a great read. I think Tip #3 is the most important thing! Happy writing! I could not agree with you more, on hand letter writing.